This Starting Gout Treatment Guidelines article is for all confirmed gout sufferers who are confused about stopping gout pain. I’m confused about stopping gout pain! That doesn’t mean my gout pain. My gout pain left me almost 5 years ago, and I do not expect it back. See Starting Gout Treatment Guidelines summary. No, I’m confused about your gout pain. I don’t understand why you put up with it. I don’t understand why you don’t want to be free from gout. I need to understand so I can help you better. When I wrote my Gout Treatment Guidelines, it was my personal project to help me beat gout. I was frustrated because I didn’t understand gout. I was angry, because I got conflicting information about gout treatment. Much of it just plain wrong. So, my starting point for controlling my gout was to learn to understand it. I learned how gout pain happens, and studied official rheumatologist guidelines for treating it. I learned that there are lots of ways to stop gout pain. It’s actually very easy, but it depends how gout pain affects you personally. You see, it is perfectly possible to control gout permanently in a few weeks. Unfortunately, the early weeks are rarely pain-free. The risk of pain is easy to manage. But, again, it’s a personal thing. I’ve done the research for you, and I’ve produced general-purpose gout treatment guidelines. My problem now is, I’ve finished with them. I don’t need them anymore. But, I want to help make them useful to you. My gout management templates help you make personal choices about gout treatment at the right time. 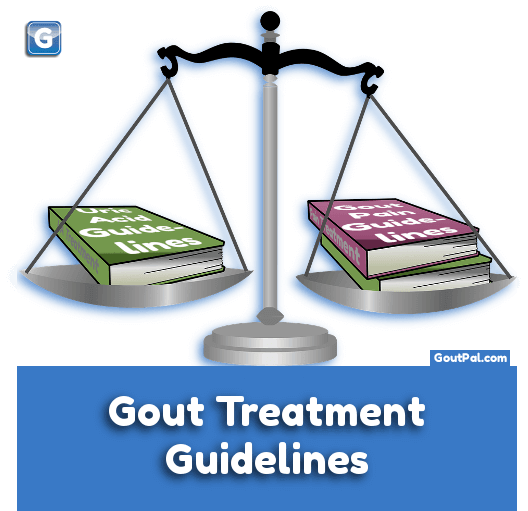 As it’s personal, every gout treatment plan is different. But, they all start in the same place: How do I stop Gout Pain? I’ve just revised that slightly to try and make it easier to start your gout treatment. I want to make it clear what your choices are. Your first choice is treating gout pain now, or preventing gout pain in future. Most people find that, as gout progresses, they get more worried about the next attack. Please do not tell me that I can eat green veggies if I am consistent. I refuse to eat, for example, broccoli 365 days a year. What! I’d never tell anyone what to eat, or what to not eat. I say: gout diet is a part of gout treatment. When you have a gout treatment plan, I’ll help you with diet if you need it. I’ll show you how to eat your favorite foods in gout-friendly ways. But, I deliberately separate my Gout Diet Guidelines from my Gout Treatment Guidelines. Discussing gout diet without a treatment plan is a waste of time. Your gout treatment plan does not need to be complicated, but you must know why you are doing it. Stop gout pain now. Nothing else matters. Prevent gout pain returning. Nothing else matters. Stop gout pain now, and prevent it returning. Prevent gout pain returning, and learn to stop gout attacks when they happen. That choice is your start. Even if you go no further with gout treatment guidelines, you have enough to start thinking about diet. It’s important to make that gout treatment choice. It’s just as important to know why you are making that choice. All these are good reasons why you want to prevent gout returning. Is your gout pain limiting your quality of life? Then, think of personal reasons why you want to stop gout pain. Is gout pain preventing you from sleeping or working? Does it stop you playing with the kids, or socializing with friends and family? All these are good reasons why you want to prevent gout returning. Make your choices about types of gout treatment. Know why you are making those choices. Then, go to your doctor, and ask for help. If you do not know what to ask your doctor, or if you do not understand your doctor’s responses, you need GoutPal help. My gout forum is the fastest way to get help from GoutPal. You can use it for questions, experiences, and opinions about Gout Treatment Guidelines, or any aspect of your gout. Ask how to start your gout treatment now.